As retail designers working across a number of sectors, we usually respond to very specific briefs when designing a store. However, the objective of our work is always the same: to provide a unique and magical experience that exceeds expectations, making advocates of our client’s customers and keeping them coming back for more. Online sales in the UK grew by an impressive 16% in 2013, taking the total revenue generated to £107bn. A further 17% growth is expected for 2014. To combat this, physical stores are pulling out all the stops to design experiences that cannot be replicated online. Queue the renaissance of the pop-up. These stores offer much more than product, indeed they are a real hybrid of social & creative hubs, as well as stores. Levi’s has recently launched its ‘Commuter Workspace’ stores in urban hotspots, which function as a resource centre for the biking community and a hangout spot. In hospitality, experiential dining is on the rise: from Mary Poppins-themed experiences, to restaurants that offer accompanying visual and audio effects to a meal, food needs to excite diners. It seems that consumers are seeking above all a personalised, engaging and memorable experience – ideally with a human touch. TIP: When designing a space, keep in mind the 3 ex’s: experience, experimentation and excitement. While in-store technology keeps wowing customers, with Burberry firmly at the forefront of this trend, at the other end of the spectrum there is a desire to strip back to basics and keep things simple. In terms of design, minimalism has been the key trend for the past few years and shows no signs of abating – see Celine’s and Apple’s success in fashion and technology. As consumers, we are constantly bombarded by information, but what most of us really aim for is to de-clutter our lives and find some form of ‘zen’ in every day life. As such, stores are also adopting clean lines and neutral tones, and displaying merchandise in a less-crowded manner. As a result, products become more ‘exclusive’ and desirable. Examples of this trend can be found in high-end fashion, with The Row and Viktor & Rolf, as well as on the high street, with Diesel Black Gold and COS. Appeal to the senses through the intelligent use of lighting, texture, music and aroma. TIP: While the wow effect is great, equally important is to focus on the totality of your offer throughout the customer journey, ensuring a seamless experience across all touch-points. Find out what your customers actually want – and then give it to them (in a way that makes sense for your business). Earlier this year, I-AM presented a talk at Istanbul’s Sustainable Brands conference, where we stated our belief that brands can make a positive impact in the world. Brands have the power to create invaluable positive environmental and social impact. But adopting eco-credentials for the sake of ‘looking good’ won’t get you very far. Products that are good (ie, give customers what they want) and also do good (ie, in some way make a positive impact on their surroundings) are the ones that last. While it would be nice to think that some companies do good things for altruistic purposes, there is certainly no harm in telling people about them – but make sure that your story is clear, concise, relatable and meaningful. If it creates an emotional pull, all the better. 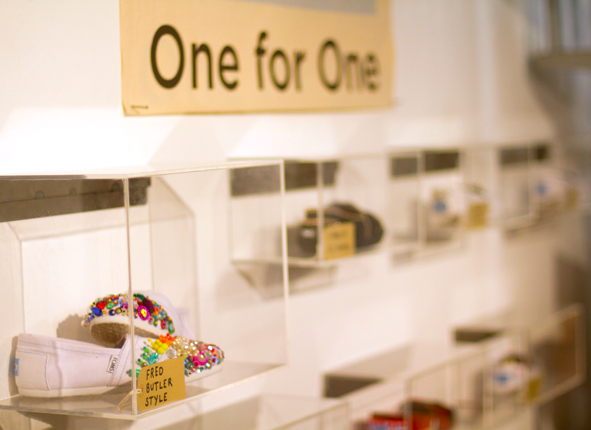 During Sustainable Brands Istanbul we cited footwear brand TOMS’ one-for-one offer as an excellent example of a fashion company doing good with a good product – and benefiting from a well-told story. Many others have followed suit. Australian beauty brand Aesop is also making waves with its conceptual, minimalist stores, which are often made using eco-materials. Their Melbourne store was made using industrial-grade cardboard, assembled into boxes and laid out in flat stacks, resulting in a visually arresting space. TIP: Be authentic – tell a story that is relevant to your business and your stakeholders. Make it believable – and true! A recent Multi-Screen World Research Study by Google showed that 90% of participants switch channels while making a purchase during their daily lives. In the UK, Brits alone use an average of 3 devices daily, and 74% of smartphone users go online every day. And with nearly everyone in Western Europe and the US having access to a smartphone connected to the internet, it’s no wonder that people talk about a retail revolution. What’s also clear is that the future is omni-channel. Just being accessible to your customers via all of these channels won’t cut it: your physical ad digital channels need to be interconnected. This shift has been particularly noticeable in the financial sector. Where once physical branches served as functional locations in which to carry out transactions, those transactions have since moved online, and the branch is now a place to engage with customers in order to up-sell. As a result, banks have started to think more like consumer retail brands. Today’s customers are well connected, well informed and can shop at their convenience. As such, they expect to have the same seamless brand experience across all formats. Businesses can take advantage of the opportunities created by this trend, by utilising new channels to build brand loyalty and advocacy. Burberry and Topshop are already at the vanguard of this movement, integrating social media activities with retail facets of the business, especially using networks like Pinterest and Instagram to create a “social shopping platform” to encourage customers to purchase an experience that goes beyond product. Meanwhile, Starbucks offers a rewards app, which enables customers to check and top up their Starbucks card balance through their phone, the Starbucks website, or in store. Any changes are updated in real time, across all channels, and payment for products can be made using the physical rewards card or via mobile devices. TIP: Don’t just invest in the latest technological ‘fad’. Choose channels that are right for your customer and right for your products. Then, create a brand experience where digital and physical touch-points are fully integrated. And don’t underestimate the power of human interaction: customers find it reassuring. Find ways to incorporate the two. One example is Personal Capital, an online financial advisor, which allows ‘‘in-person’’ advice via FaceTime.